Tick species are found worldwide and may infest dogs in very large numbers, especially during certain times of the year. These blood-sucking parasites are often found in tall grass, where they will attach themselves to a passing animal. 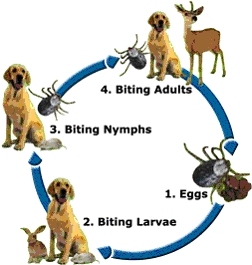 Ticks require physical contact to infest your pet, and harpoon-like teeth allow them to anchor firmly in place while sucking blood from their animal host. Ticks also act as vectors of disease. Ticks can carry and spread the organisms that can cause Lyme disease and other potentially deadly diseases (although not usually in the UK). 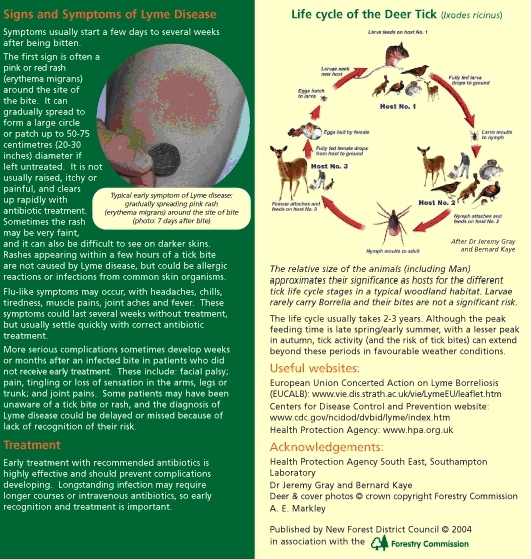 A single tick can carry several disease organisms at the same time. Tick-borne diseases have been diagnosed in your region – Lyme disease is occasionally diagnosed locally. You and your pet spend time camping, hiking, or walking in the New Forest. Your dog is exposed to wildlife species that are frequent tick hosts (deer, rabbits, hedgehogs etc.). Your garden has dense shrubs, tall grass, or leaf litter which serves as common tick habitats. 1. Eggs - Female lays eggs off host. Eggs hatch to larvae. 2. Biting Larvae - Larvae feed on dogs or small mammals. Larvae leave host and molt into nymphs. 3. Biting Nymphs - Nymphs feed on dogs or small mammals. Nymphs can transmit disease-causing organisms as they feed. 4. Biting Adults - Adult ticks feed and mate on the host. Adults can transmit disease-causing organisms as they feed. There are several tick medicines which may be used in dogs and one which can be safely used on cats, the best choice will depend on many factors, including the pros and cons of each individual tick medicine. Please call us or drop in during surgery hours to discuss your pet’s tick prevention requirements if you are experiencing problems with these parasites. Tick prevention is particularly important if you are traveling abroad with your pet as life threatening tick borne diseases are much more prevalent in France and elsewhere on the continent. Ticks are a threat to dogs because they can carry a number of different diseases which can be dangerous for the infected dog. Ticks can also become a threat to family members if they are bitten. There are a number of different medicines which can be used to control ticks in dogs. We can also supply a special device, called a tick hook, which can be used to safely remove ticks from you dog, cat, rabbit or even yourself. The main danger when removing a tick is accidental breakage of the tick’s body, which leaves the tick’s small, embedded head in the skin. Infections can occur and usually veterinary attention is required to aid removal of the fragment and possibly provide antibiotic cover as well.